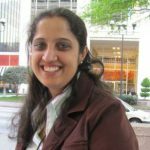 Saraswathi (Saras) Bellur (Ph.D., Penn State University, 2012) is an Assistant Professor in the Department of Communication, University of Connecticut (UCONN). Situated in media effects, Dr. Bellur’s research focuses on understanding the psychological and physiological effects of interactive media on key communication processes and outcomes. With several publications in flagship journals in the field, Dr. Bellur’s work has contributed to both theoretical and empirical body of knowledge surrounding interactivity research. Dr. Bellur’s research has also focused on explication and measurement issues related to interactivity, cognitive heuristics and user engagement. Dr. Bellur has co-developed a new theoretical framework called the motivational technology model, which examines how we can harness unique affordances of new media, such as interactivity, to boost individuals’ intrinsic motivation, and encourage them to engage in preventive health behaviors. Her recent work has also examined the effects of media multitasking on learning and enjoyment. Dr. Bellur looks forward to pursuing innovative and collaborative projects that contribute toward a theory-driven understanding of communication technologies and their effects. Bellur, S., & DeVoss, C. (2018). Apps and Autonomy: Perceived interactivity and autonomous regulation in mHealth applications. Communication Research Reports. Oh, J., Bellur, S., & Sundar, S. S. (2018). Clicking, assessing, immersing and sharing: An empirical model of user engagement with interactive media. Communication Research, 45(5), 737-763. Bellur, S., Nowak, K. L., & Hull, K.S. (2015). Make it our time: In class multitaskers have lower academic performance. Computers in Human Behavior, 53, 63-70. Kim, K., Schmierbach, M. G., Bellur, S., Chung, M-Y., Fraustino, J. D., Dardis, F., & Ahern, L. (2015). Is it a sense of autonomy, control, or attachment? Exploring the effects of in-game customization on game enjoyment. Computers in Human Behavior, 48, 695-705. http://dx.doi.org/10.1016/j.chb.2015.02.011.